The Overthere Stair is a series of clouds leading from The Underwhere upwards towards The Overthere in Super Paper Mario. There are numbers made of clouds found along the way so that a traveler wouldn't get lost. It is the longest level in the game. Our heroes had found their way out of the dark and confusion of The Underwhere. Mario and friends now saw the sun shining brightly against a beautiful blue sky. This was the sky paradise Grambi called home, a place of joy called The Overthere. Somewhere above the never-ending layers of clouds waited Grambi himself. Peach sleeping beneath a fruit tree. Overthere Stair requires the player to move upward using clouds as platforms to advance. The first stair begins with a series of clouds. A Parabuzzy is found along the way. The player will then reach a long cloud with an Ice Cherbil and some ? Blocks, one of which contains a Super Shroom. To the right is a platform to carry the player up, passing some coin-covered clouds. 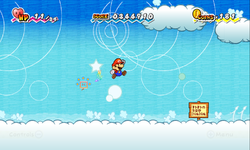 The player must then continue across clouds to the left, passing a Spiky Parabuzzy and another Ice Cherbil, then use Luigi's super jump to reach a cloud with a Jump-Over Cloud that can be used to reach another Jump-Over Cloud with some Parabuzzies nearby. The second Jump-Over Cloud will take the player to a door leading to the next stair. At the next stair, there are some Beepboxers standing on ? Blocks. All of the blocks contain Zombie Shrooms, save one, which holds a Speed Flower. Past these are some more clouds leading upward to a Save Block. Continuing left pasta Spiky Parabuzzy are clouds leading to a Jump-Over Cloud, taking the player to a spot with another Jump-Over Cloud, several coins, and a Ruff Puff. To the right of the next Jump-Over Cloud are two Rawbuses guarding their own Catch Card. The third Jump-Over cloud takes the player to an area where they must continue right, encountering a Beepboxer, an Ice Cherbil, and several Ruff Puffs, to reach yet another Jump-Over Cloud, taking the player to a cloud to the right of the next door. Stair 3 has two Beepboxers and a ? Block containing a Ghoul Shroom, before a Jump-Over Cloud, taking the player to a door. The door leads to a tree holding Blue Apples, which the player can obtain by using Boomer, Thudley or Cudge near the tree. Back out the door, the player must go left past some enemies. There is a Ruff Puff card to the far left. Continuing upward are more enemies and a ? Block holding a Mushroom. Soon, the player will reach the top of this set of clouds and must flip into 3-D and use several blocks to move forward/right. The player must then move down to reach a Jump-Over that takes them to Stair 4. Stair 4 has two paths. To the right, the player may go up to a platform of Hard Blocks, where there is a Lakitu and a Jump-Over Cloud taking the player to a door. The door leads to an area with several clouds, a Happy Flower and a tree bearing Red Apples. The other path, there is a Squig and a Squog next to a vertically moving platform, which takes the player up to a spot with a door and a Save Block on the right and another platform on the left. Through the door, the heroes find Princess Peach, who is asleep. They try as hard as they can to wake her, but do not succeed. Luvbi states that Peach ate a Golden Apple, which causes a person to sleep so deeply that they do not wake up for centuries. She initially says that there is no way to reverse the effects, but then remembers a "taboo fruit" that her father once spoke of. However, she has no idea where the fruit is, so the heroes look by themselves. Back out the door, the player must right the vertically-moving platform up. To the left, there is a Shroom Shake in a chest. To the right is a Lakitu next to a Jump-Over Cloud, which takes the player to yet another crossways. To the left, there is a sign reading "Orange Fruit Hither". Mario may flip to find a path in 3-D to a hidden door, where there is a tree bearing Orange Apples. To the right is a Squig and a Squog next to the door leading to Stair 5. To the immediate left of the start of Stair 5 is a door leading to a tree bearing Pink Apples, found in 3-D. Up and to the right of the stair is a door leading to an area with a Skellobit, a Spiky Skellobit and a Skellobomber, which must be defeated to leave the area. To the right of the door is a ? Block containing a Mushroom and a Coin Block, as well as a vertically-moving platform taking the player to a cloud, where a door leading to Black Apples, the fruit needed to wake Peach, is found in 3-D. The heroes return to Peach. Each apple has a different effect on her. Red Apples cause her to wake up, then grow to an enormous size, then fall asleep again. Conversely, the Blue Apple causes her to shrink down. Orange Apples cause her to wake up, grow a mustache, then fall asleep again and the Pink Apple turns her into a Peachy Peach. All of the apples' effects are temporary. The Black Apple, however, is so bad-tasting that is causes Peach to wake up screaming. After learning the situation and meeting Luvbi, Peach rejoins the party. With Peach in the party, the player can now continue through Stair 5. To the left is a Jump-Over Cloud taking the player up to an area with a short staircase of Hard Blocks, which Peach can use as a starting point to float across to the left, where she can use three Jump-Over Clouds in a row to reach Stair 6. There are three Skellobits and a Reversya Cursya at the start of Stair 6. To the far left is a Super Shroom and two vertically-moving platforms, which take the player to some floating pillars near a Jump-Over Cloud. The cloud takes the player to a spot with yet another upward-moving platform, which takes the player past a Cursya guarding a Long-Last Shake. Past two more Skellobits is the end of Stair 6. Stair 7 begins with a Skellobit and Skellobomber, followed by a Jump-Over Cloud, taking the player past another Skellobomber to another Jump-Over Cloud, which takes the player to another set of pillars, these thinner than the previous set. Past the pillars is a horizontally-moving platform, taking the player underneath a shrine. There is a Life Shroom in a chest nearby. In the shrine are two Skellobits and a Spiky Skellobit. To the left of the shrine is Cyrrus, a sentient cloud who wants to be enormous. He asks the player is they have anything that could make him grow big. To his left is a switch that rveeals a pipe leading back to the door where Peach was found, allowing the player to save and collect apples for Cyrrus. The apples have the same effects on him as Peach. The Red Apple with cause Cyrrus to grow large enough to bounce the player into orbit before they fall back down to the very top of Stair 7, where there is a shrine with a door underneath and a Gold Bar on the roof. The next area has a sign reading: "Here Endeth Overthere Stair. The Overthere is Over There." Peach must be used to float across a wide gap to the Star Block. "This fluffy road leads to the Overthere Stair. You met up with Peach again here among the clouds. Be careful not to fall between the clouds..."
This page was last edited on April 9, 2019, at 17:48.